You may recall a couple of weeks ago I was given the Premio-Dardos award for excellence in blogging. Rita Gerlach, of InSpire blog, asked me what, "Premio-Dardos," meant and what was depicted on the award. These questions started a search of the Internet. I Googled it. I Wikipedia'd it. I even Snopes.com'd it. At first, I couldn't find a satisfactory answer. Then I came across a blog, which stated that Premio-Dardos was Italian for, "Prize Darts." Rita examined the award itself, and discovered it showed an old-fashioned typewriter with plumes of words rising from the machine. So, the mystery's been solved. Thanks, Rita, for prompting the investigation. By the way, Rita has another installment out on her Stepping Stones Magazine for Writers. Check out Platform Building Part 2 - Cultivating a Fan Base. 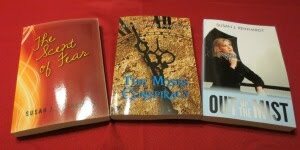 Sue Cramer, over at Praise & Coffee, is doing a February giveaway. Leave a comment for an opportunity to win WOW Hits 2009, coffee, and Bayview Cards. If you put her button on your blog, you'll be entered a second time. Ooh, I haven't listened to a WOW cd in forever. So that's what it means? Pretty cool. Have a great weekend, Susan. Cool! Thanks for the info Susan! Yeah, Rita and I were both curious what Premio Dardos meant. I'm sure we weren't the only ones. Thanks, Susan, for the mention, especially about Stepping Stones Magazine for Writers.